This incredibly satisfying and hearty Weight Watchers dinner recipe, is perfect to warm you up on a chilly fall evening. The tender and juicy ground beef is wonderfully seasoned, uniquely including a hint of cinnamon, and is served with whole wheat orzo and a delicious tomato sauce. 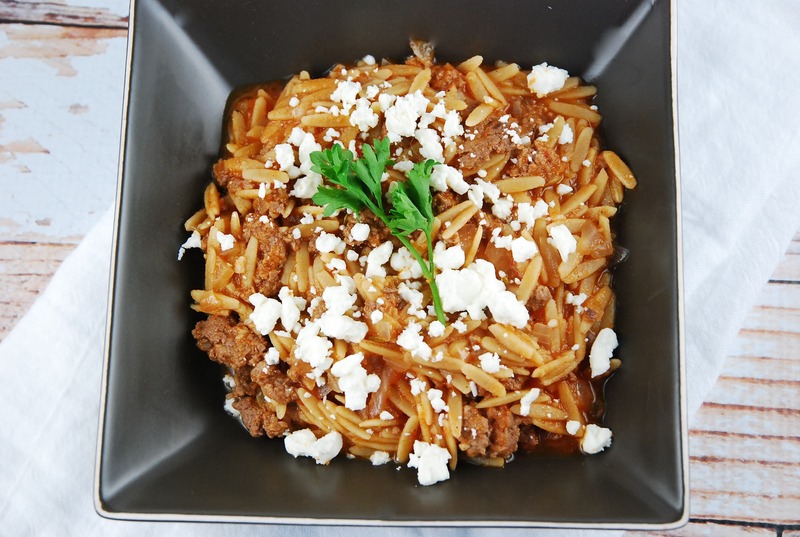 Adding the feta crumbles on top also gives this dish a deliciously distinctive flair, adding a bit of salty savory-ness to the slightly sweet flavor of the sauce and beef. It cooks quickly and easily, and goes great when paired with a light salad and/or fresh roasted vegetables. 8 Points is a great bargain for this ground beef recipe, considering how filling it is! Enjoy. A blend of wonderful flavors and a hint of cinnamon come together with tender, juicy ground beef and whole wheat orzo to create a lovely, and savory dish. The salty feta topping helps to create a unique flavor profile without being overwhelming. Prepare orzo according to package directions. Drain and set aside. While orzo is cooking, spray a large skillet with nonfat cooking spray, and set over medium high heat. Add in beef and cook until mostly cooked through. Add in onions, garlic, oregano, cinnamon and salt & pepper. Sauté until onions are tender and beef is cooked all the way through. Pour tomatoes into skillet with the beef mixture, and cook, and turn heat to medium. Continue to cook, while stirring occasionally, until mixture has thickened, about 15 minutes. Toss beef sauce with orzo and place into serving bowls. Top each bowl with 1 tbsp of feta. I have searched most all sites for lofat recipes and i must say this is the most excellent site. I have lost 50 lbs on wieght watchers and one of the main reasons –is your recipes. One can actually feel like you’re not being singled out as a dieter. Everyone in my family which includes ages 12 thru 60, loves most everything ive made from your recipes. Thank you so so much for your hard work!!!!! I agree. I have made laaloosh recipes for a long time now, whether I’m dieting or not – because they are simply DELICIOUS, healthy and filling !! They are also written well – a lot of other blogs leave out facts or steps and things don’t always turn out perfect. But on this website they do! Thank you for your recipes!! !